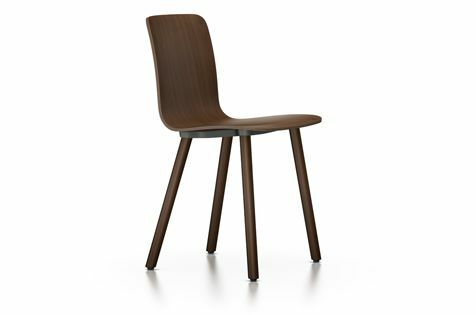 HAL Ply Wood, a chair belonging to the extensive HAL product family designed by Jasper Morrison, combines a comfortable plywood seat shell with a distinctive four-legged base. The seat and legs of the chair are available in various types of premium wood with matching finishes. Non-stackable wooden base in light oak, dark oak or black-pigmented walnut. Connecting element between shell and base in die-cast aluminium, powder-coated in dim grey.